Danica Patrick became the first female winner in IndyCar history after claiming the Indy Japan 300 race at the Twin Ring Motegi racetrack on Sunday. The 26-year-old, in her 50th IndyCar race, finished 5.8594 seconds ahead of Helio Castroneves in Japan. "It's been a long time coming - this is fabulous," said Patrick. 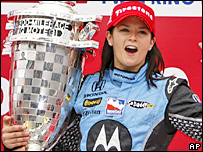 Patrick made her name in American motorsport by finishing fourth in the Indy500 in 2005, and came seventh in the overall standings last season. "It was a fuel strategy race, but my team called it perfectly for me," added Patrick, who drives for the Andretti Green Racing team. "I knew I was on the same strategy as Helio and when I passed him for the lead, I couldn't believe it. "I knew there was a good reason for coming to Japan. I want to thank my team, the fans and everyone who supported me. "I've been asked so many times when and if I could win my first race and finally, no more of those questions." Patrick took the lead from Castroneves on the 198th lap of the 200-lap race after starting in the third row. "I think Danica is such a fantastic person and I'm thrilled for her that the monkey is finally off of her back," said Michael Andretti, co-owner of Andretti Green Racing. "We have all believed in her and she proved today that she is a winner. Frankly, I think this is the first of many."